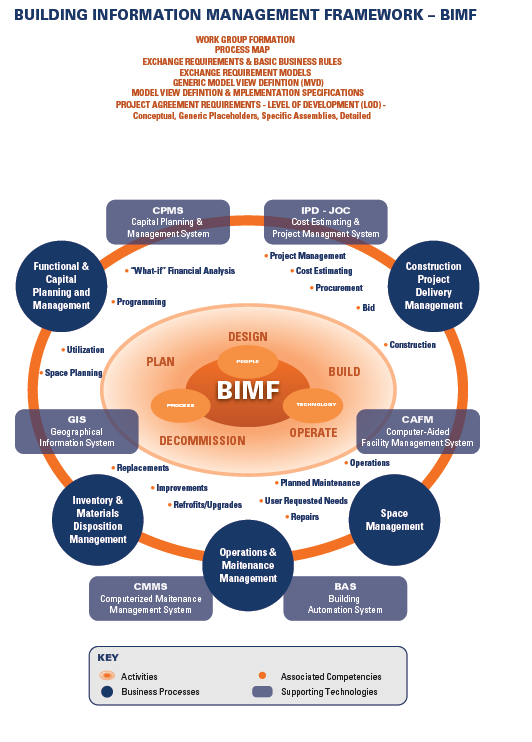 BIM (Building Information Modeling) is the life-cycle management of the built environment supported by digital technology. 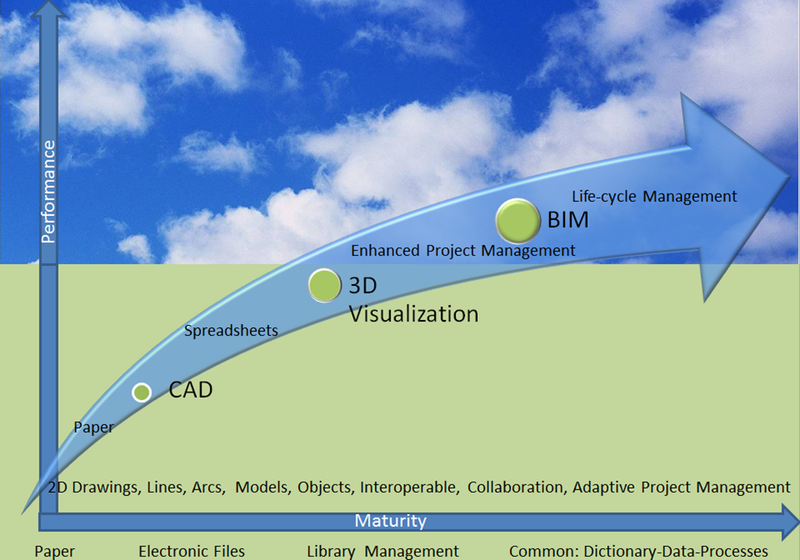 3D visualization vendors have marketed BIM poorly. Their focus has generally been upon 3D modeling and associated visual objects vs. the collection and use of valuable and enabling INFORMATION. Sure 3D visualization is a great tool, and a useful component of BIM, however, it’s not even the most important aspect. 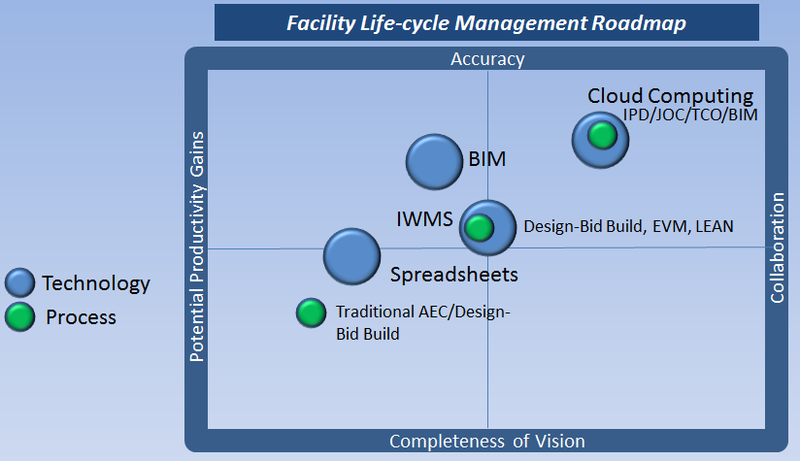 Many, if not most organizations will require significant “change management” in order to successfully implement life-cycle management / BIM. 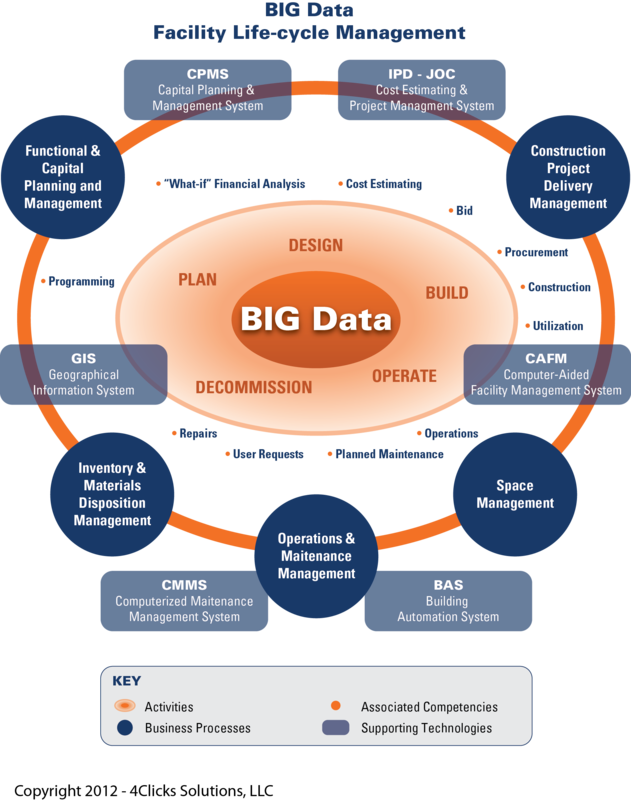 Owners, AEs, Contractors, Oversight Groups, Business Product Manufacturers, and Software Vendors will need to adopt a better understanding of several, currently disparate knowledge domains / competencies and technologies and work towards efficient, transparent information sharing and collaboration among all area, professionals, and stakeholders. Cloud computing / social media, BIM, and other ‘disruptive technologies’ combined with market demands driven but altered environmental and economic global landscapes will likely help to drive change, however, timing is uncertain. There is a serious hole in the Architectural, Engineering, Construction and Owner Sectors’ level of understanding of building performance and legacy beliefs and process simply don’t work. – adaptation of work by Melanie Thompson of Get Sust! We must initiate a wider discussion on what constitutes an appropriate, progressive life-cycle management of the built environment. The effectiveness and efficiency of this deployment will be dependent upon people asking the right questions. Efficient project delivery methods such as Job Order Contracting – JOC, a form of Integrated Project Development – IPD, that specifically targets renovation, repair, sustainability and minor new construction will be integral to successful BIM or life-cycle management based solutions. Collaboration and longer term relationships are primary components of JOC and equally central to BIM processes. Behaviors across all AECO (Architecture, Engineering, Construction, Owner) professions, building users, and oversight groups must change. Ad-hoc, inefficient, and adversarial construction delivery methods such as Design-Bid-Build represent a serious impediment to efficient use of resources. Additionally, life-cycle management must be addressed on portfolio and local levels within the context specific buildings (or structures), inclusive of type, activity, and utilization. For this we need a fundamental shift in approach, applying the proven as well as yet to be developed methodologies and tools developed. changes in business models, supply chains, the distribution of risk and responsibility, professional identities, the division of labor and so on. September 2012 – via http://www.4Clicks.com – Premier cost estimating and efficient project delivery software for JOC, Job Order Contracting, SABER, IDIQ, MATOC, SATOC, POCA, BOC, MACC …. featuring exclusively enhanced 400,000 line item RSMeans Cost Data with modifiers and full descriptions. The ACE Job Order Contracting (JOC) Certificate Program is an in-person, 56 hour program that will result in attendees receiving their JOC Professional Certification upon completeion of the program and the passing of the Certification exam. There are no prerequisites to enroll in this program, but basic knowledge about the construction process will be assumed. A certificate of completion will be awarded for successful completion of the course and 5.6 noncredit CEU’s will be awarded for those who attend and successfully complete the 56 hours of instruction (3 absences are allowed to receive full CEU’s). If you have not registered for meetings online, please click LOGIN button for information on creating your ACE website account. If you have any questions, contact the ACE office at 480-965-4246. Don’t Forget to Download your Presentation Files! Registering for a Task Force Meeting gives you access to the presentation materials! Find them here! Explore and download three years worth of Task Force Meeting and Seminar Presentations, all available for download in our archive. Click here to view our entire archive! Offering the flexibility to learn at your own pace! Stay Up to Date with ACE! Get the ACE app for your smart phone! 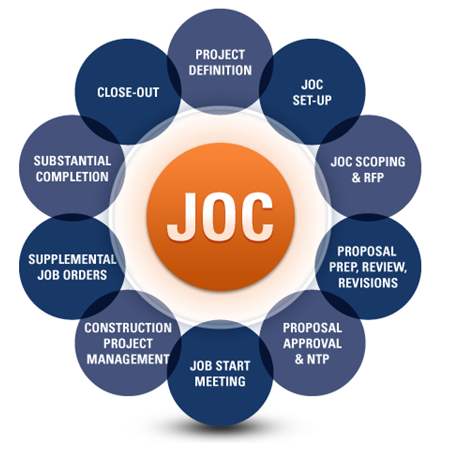 Job order contracting – JOC – is an innovative procurement technique designed to provide more responsive facility maintenance, repair, sustainability, and minor construction. It is intended to significantly reduce engineering and procurement lead-times by awarding a competitively bid, firm-fixed-price, indefinite-quantity, multitask contract (IDIQ) to a single general contractor. The contract consists of detailed task specifications for a multitude of real property maintenance activities encountered within a specific geographic area. Use of a job order contract (JOC) avoids separate design, specification, and construction contracting actions. Prepriced units of work are used to help streamline the process. The contracts are awarded by competitive procedures. Upon award, a contractor receives individual task orders, also called delivery orders, based on continued levels of high performance. This incentive mechanism is unique to JOCs. JOCs are based on a proprietary or commercially available unit price book (UPB) that lists all tasks encompassed by a contract with a corresponding unit price. The vast majority of JOC contracts use RSMeans Cost Data in some manner. 4Clicks Solutions, LLC offers exclusively enhanced 400,000+ line item RSMeans Cost Data access inclusive of full line item descriptions and modifiers. This UPB can be localized and supplemented with client specific line items and place within a power, easy-to-use software solution that automates many aspects and helps to assure consistency of JOC implementations. In making offers on the JOC contract, offerers propose multipliers or coefficients for work performed during normal working hours, and for work performed during other than normal hours. Multiplying the UPBs unit prices by the appropriate coefficient determines the total price. Should the task order include supplemental items that the UPB does not identify, the contractor and the owner jointly determine a fair price for these items. These items are added to the UPB work for a total cost of completing a task order. The items that are not included in the UPB are called either non-prepriced items (NPIs) or non-prepriced work (NPP).